This chocolate chip cookie is made to have the same amount of caffeine as an energy shot! I’ve actually tried one of these before and they’re good! Soft, too, which I like. I think I’ll add this to one of my husband’s lunches so he can have a little afternoon pick me up at work! I liked these! They have a great flavor and the texture of the walnuts are perfect for me. I tried a couple out of the bag, but I think they’d actually be great over a salad or yogurt. I’ve tried this brand of granola in a Mitten Crate before and loved it so I was excited to see more this month! The Cherry Almond granola is my favorite between the two. I just love the classic combination of flavors, which are well-balanced, along with the textures. The Lavender & Chocolate Chip granola was interesting but good. I still don’t know if I love eating my lavender, but I didn’t think it was bad! The herbal flavor was interesting against the sweet chocolate chips and crispy coconut flakes. I’m happy to have tried it! I just don’t think I’ll buy a full bag of this one. I love this idea! These packets are pre-mixed pizza seasoning and all you need to add is a 28 oz can of crushed tomatoes. The herbs smell amazing but I haven’t cooked with them just yet. There’s a lot of seasoning in here – one packet’s preparation can cover 5 medium pizzas, 4 large pizzas, or 2 Chicago-style pizzas. This pasta is made with garlic oil and roasted & dried garlic. Also, it’s made to be low-carb! It has 24g per serving vs. 38 in their normal fettuccine. This is another brand I’ve tried from Mitten Crate before and I loved it! Plus, I love garlic. Verdict: After subscribing to Mitten Crate for almost a year now, I’m noticing some familiar/repeat brands, but I’m honestly totally okay with that because I love everything they send me and they’ve sent different flavors and variations than I’ve tried before. I liked the mix of foods they sent this month and that there are snacks as well as cooking products. The value adds up to $26.88 – lower than the cost of the box, which I’m a little bummed about but I have come to expect a value around breaking even or a little less from Mitten Crate. 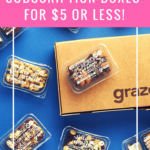 Food boxes are generally the lowest value subscriptions out there, so I think it’s really up to each individual if retail value alone is what they’re looking for in a food subscription. For some, I know that the curation and discovery are well worth the difference, especially if you find that you consistently like basically everything the subscription sends, and also tend to go order more from each vendor of your favorites. While I’d always appreciate a higher retail value, I fall into the latter category – I’ve gone and bought full orders from many companies I’ve found through Mitten Crate! I gifted mitten crate subscriptions to 2 Michigan loving family members for Christmas. They think I’m brilliant for thinking of it, lol. They are very difficult to buy gifts for but are very happy to try new Michigan made food. The donation to Gleaners is also appreciated. Michigan has taken such an economic hit and these small businesses are ways for people to make a living wage. From the blog and face book page it seems that Mitten crate pays for the food they send out so maybe that is why the value is so low. I’m happy that the boxes have arrived in good shape and a day or 2 earlier than they said. My only complaint is that there is no way (or at least there wasn’t in December when I ordered) to send a gift message. Hopefully that will change. Lol – I thought this was a box of mittens. Thought it might be something to send to my daughter who recently moved to Minnesota. Ummm, you’re not the only one. Haha. I assumed it was mittens and scarfs and such. This Florida girl never looked twice. Definitely needed a better name.